I got to catch up with Jordan earlier this week and ask about her sporting career as well as the future of her sport and career. Cathal: What age did you start kickboxing at? Jordan: I started kickboxing at the age of 6 so I have currently been training for the past 11 years, nearly 12. Cathal: What is the training like and how often do you do it? Jordan: The training is very intense as you compete all year round. Usually, I train 5 to 6 times a week but this year due to studying for my Leaving Cert I can only train 2 to 3 times a week. Cathal: When did you win your first tournament? Jordan: As I started at the age of 6 and I had to wait 2 years until I was able to compete at local competitions. It took me just over a year to win my first tournament which was ‘The Best of the Best’ which was run by Patrick White in Kingswood, Tallaght. Cathal: When did you win your first national title and how did it feel to do so? Jordan: I won my first Irish National title in 2013 when I was 12 years of age. I actually won two national titles that year in Points-Fighting and Light-Contact. Cathal: How in your opinion is Ireland stand up or compared to the rest of the countries in kickboxing? Jordan: In my opinion, Kickboxing Ireland is one of the strongest teams on the international circuit to date. Ireland always finishes within the top 4 countries alongside Hungary, Russia and Italy out of 28+ countries… And if you think about it our country isn’t near as big as the 3 I have mentioned and yet we still place within the top 4 in the overall medals table. Cathal: What is it like to stand up on a podium and hear the national anthem playing for you winning? Jordan: Well, I won my first World title at the age of 13 in 2014 in Rimini, Italy. And in all honesty, it was the most sensational experience. It was so emotional, I mean as an athlete it is your dream to stand on a podium and hear your National anthem playing in the background. And for me personally, no matter how hard I try I have no words that could describe how I felt at that moment. Cathal: What is your proudest moment? Jordan: My proudest moment to date would definitely be during the 2018 WAKO World Championships in Jesolo, Italy. I am the only female Irish fighter to compete in all 3 tatami disciplines: Point-Fighting, Light-Contact and Kick-Light. And my goal for that week was to reach the Semi-Finals in each discipline… But, I managed to secure a place in 3 World Finals that week. 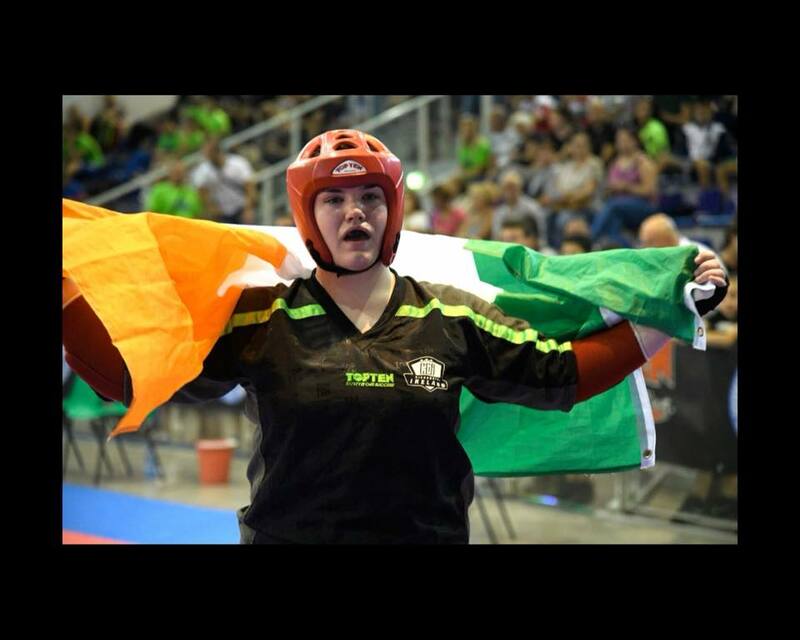 I became the first Irish Kickboxing Athlete to ever reach 3 Wako Finals and for me, it was my most memorable moment to date as the support I received from each and every single person, athletes and parents that travelled alongside me and even my friends and family at home was exceptional. And, I have each and every single one of them to thank for it. Cathal: Who are your sporting idols? Jordan: In regard to Irish athletes my idol would be Katie Taylor, not only is she exceptional at what she does but in regards to females competing in combat sports she is honestly such an inspiration. She proves to not only Irish females but every female across the country that it is more than possible to reach the highest standard in your chosen sport once you have the dedication and fully apply yourself. Cathal: Who are the most inspirational people in your life? Jordan: The most inspirational people in my life would have to be my Parents and Coaches. Without the help of my parents in every aspect of my sporting career, I wouldn’t have achieved what I have. As Kickboxing doesn’t receive funding from the government we have to raise money ourselves in order to travel, suits, tracksuits, hotel, fight fees etc… which is beyond expensive and my parents have supported me throughout it all. And I would never have competed at such a high level if it was for the dedication of my coaches and for helping me improve each day. Cathal: How do you feel now that WAKO (the World Association of Kickboxing Organisations) is internationally recognised by the Olympic Council and what will it do for the sport? Cathal: What are your plans for the future in the sport? Jordan: I personally will be competing as long as I possibly can. I hope to compete on the Irish International Team for years to come. But overall, I hope to be able to work closely with the younger generation of our sport and help them achieve what they want. I want to be able to give back to the sport that gave me everything, Confidence, Dedication, Respect everything I feel has helped me achieve what I have to this day.